It was predictable really. For the past few months I’ve been trying to string together a set of interviews with investors based in the US. Some of these people didn’t have much of an idea who I was, so the schedule was always a bit precarious. In the event, it wasn’t that anyone dropped out late last week (although that may still happen), it was actually that I got a new interview confirmation in the form of Joel Greenblatt. Fast forward a couple of days, I’m now here in New York City. It’s hot - somewhere above 30 degrees, which the locals seem fine with… me less so. 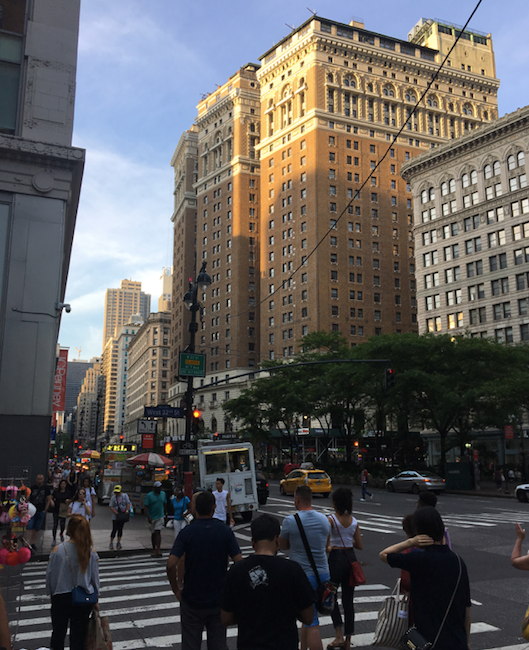 I landed at Newark Liberty Airport in New Jersey, and then took a 40 minute train ride into Midtown Manhattan. For a Sunday evening it’s pretty busy out there in the city that never sleeps. As for me, I’m not really sure what impact the five hour time difference will have going into this week - possibly not very much. But with three interviews now packed into just a few hours tomorrow, is not quite as easy as it was. It kicks off with Joel Greenblatt (someone that I worked very hard to get hold of), followed by Barry Ritholtz, the wealth manager and media personality. Then after that I’m meeting Ted Seides, the hedge fund manager famous for, among other things, making (and losing) a 10 year bet with Warren Buffett. Meanwhile, the schedule over the next week or so looks like it will probably see more changes. I’ll check back with an update on how the interviews go, plus preview what could turn out to be a slightly unusual interview on Tuesday. Manhattan is famously constructed on a ‘grid’ system. A series of long avenues (some of the famous ones being Fifth, Lexington and Madison) are intersected by numbered streets. When the street lies west of Fifth Avenue then you get something like West 24th Street. East of Fifth Avenue, that same street is called East 24th Street. Ben - you've actually got selfies with Greenblatt and Ritholtz ! That's too good. I can't wait to read the interviews. Good luck with your military training session. Not sure we want to see Ben in his gym gear! Ben, I'm so envious! What a dream assignment. Looking forward to reading the reports (did you video them?). By the way, I'd recommend 'The Little Book That Beats The Market' (Greenblatt) for anyone with with kids/or grandkids that take an interest in investing. Its actually pretty good for us big kids too! I give Greenblatt's book to everyone who starts working here. It's just a brilliant synopsis of the history of value investing, basic financial ratios, the basics of systematic investing & the StockRanks too. Super Update Ben, really looking forward to the interviews and a great idea to whet our appetite! I've read Greenblatt's books and seen his interviews, he's excellent. The interview with the marine sounds epic! Can I also suggest "The millionaire next door" for anyone with kids/grand kids interested in investing. Thanks for the support there Jamie ! Very interesting. I would be curious to know if any of these managers would ever consider an investment vehicle other than a US mutual fund as these only tend to be available to people residing in the US. I heard Joel Greenblatt describing, in a podcast with Barry Ritholz, his (relatively?) new 200% long / 100% short fund offering based on his factor investing model. It sounds really interesting and supposedly delivered something like 600bps/year in outperformance in backtesting. But, unless it's traded on an exchange, it's unlikely ever to be available to me. This is so good Ben! Can't wait to read/hear the interviews! Hi Ben, thanks for the latest update - entertaining as usual. Sorry to hear you didn't get to work out with Wes Gray & I hope he has a big bull in his garden to counter that bear in the kitchen! When you are back from your run (on reflection I think we do need photographic evidence) you and other subscribers might be interested in these videos from a couple of the guys you have interviewed plus one other who is probably not on your hectic schedule. When researching for 2 years before starting investing it was Todd Wenning's approach, reasoning and Dividend Investor recommendations that put me on the right path. Lookling forward to seeing the interviews, enjoy America. Good read, looking forward to reading your interviews. Like how do you scan for a moat?! I’m no guru Kenneth but I screen for a moat by looking at gross margins and the trend thereof (I also include operating margins and ROCE). Thereafter, you have to look under the hood and understand what their moat is and judge the sustainability. It will be interesting to see what the pros experts have to say when Ben reports back.